Ridley Howard started exhibiting in New York 17 years ago along with a group of figure painters who didn’t embrace the irony of the “Bad Painting” school that dominated the art world at the time. His canvases of figures set within deceptively simple tableaux in interiors and landscapes, as well as his portraits, were unashamed at being seen as beautiful and sincere. Their smooth textures have a distinct soft focus and, much like Alex Katz, Howard’s canvases display a cool detachment allowing for multiple interpretations. For Howard’s current exhibit, Travel Pictures, his first with Marinaro Gallery, the artist presents eight new paintings in which his signature satiny surfaces and unique representations of figures can been seen along with recent experiments adding abstract elements into the designs. It is tempting to take the exhibition’s name as a clue to the meaning of these works: five pieces do have titles that imply travel (mostly to Italy), while one painting has imagery explicitly about tourism. This latter work, Benvenuti Lovers (2017) [the title of which evokes the phrase Benvenuti amici, or “welcome friends,” a popular sign in Italy], depicts two women standing together in front of an ocean view with cliffs in the background, as if having their picture taken. In the upper left-hand corner of the painting is a fragment of the Italian flag, operating as an abstract band at the support’s edge, while just below, moving off to the right, is part of the word Benvenuti, cut off by the frame. The color scheme is dominated by pale blues except for the flesh tones of the women's faces, their brown hair, red lips, the red on the flag, and the orange text—all of which contrast the cooler tones. This arrangement of color leads your eye from the bottom right, along the central cliffs, up to the flag, then down to the text, returning again to the Lovers. Considering how the formal properties of Benvenuti Lovers function, the show’s title can also be taken as a metaphor for how the eye moves through these paintings. With this parallel in mind, Howard’s play with abstraction manifests in several specific ways in the exhibit. In Kissers in the Mountains (2017), the artist combines a flat yellow background with colored bands below it and to its left. This yellow field sits above the image of a mountain painted in muted greens and blues. Upon the yellow section, Howard paints the heads of two couples kissing, creating a more cerebral rather than visual movement through the painting’s space. In two of the larger and perhaps more audacious pictures, Bologna (2017) and Passegiata, Rome (2017), he again undercuts the convention of pictorial space. Both pictures show a landscape with the fragment of a figure placed near the upper left of the canvas. Bologna reveals a scene of a bending road with trees and flowering bushes of white and violet behind a low pink wall. Peeking out from behind the flora at the left of the composition is a portion of a white building and, above it, the face of a woman with sunglasses and a red-orange shirt. This disembodied head could be a snapshot taken near the place witnessed or, perhaps, visual souvenirs collaged together in the mind. By contrast, in Passeggiata, Rome [passeggiata refers to a leisurely stroll, usually in the evening], the view is of a wide roadway with a stone wall in the background and treetops just behind it. Glimpses of a city are visible through the trees. On the extreme right is a small grassy area and part of a tree running up to the top corner, acting as a border, an effect which compresses the space. Floating above, center left, are the legs of a woman wearing peach-colored shoes, illuminated against the blue sky. It is a surreal vision, suggesting that the limbs are trying to glide toward the grassy area, or possibly the visual memory of a languid walk in Rome. The standouts of the exhibit are three paintings composed without the interplay of disjointed abstract elements or ambiguous juxtapositions. Winter Painting (2017), a portrait of a man (or perhaps a self-portrait of the artist) sitting in front of a painting of a winter scene, continues the color scheme seen throughout the show: tinted blues punctuated with warm reds and oranges. At a diminutive 8 x 8 inches, it shares a room in the gallery with Bologna (50 x 66 inches) and easily seduces your attention away from the larger canvas. Movie Star (2017) is a portrait of woman in a gold dress speckled with blue and orange highlights, along with red tones for shading. She is standing on an outdoor patio of saturated red with a solid white railing that cuts into a blue sky. The woman seems to stare wistfully out past the viewer, completely dissociated from the colorful environment around her. The third picture, Over the Star (2017), resolves the most ambitious pictorial questions in this exhibition. It is a representation of two women seen through a window, laughing together as if having just shared a humorous story or joke. 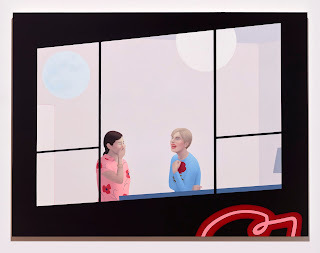 Like Edward Hopper’s Room in New York (1932), this work’s subject alludes to the connection between looking at a painting and voyeurism. The large-scale building is a mass of black framing the women, who are seen from the waist up. They are standing in a glowing room painted in soft pastels of red violets and blue violets. Hovering above them are two orbs—one a tinted blue, the other a tinted yellow—that register as light fixtures. The painting is composed almost entirely of flat shapes, except for the two women, whose heads and arms are painted with the most volume. The floral patterns painted on their shirts echo a red and orange arabesque shape on the lower right of the building, suggesting part of a neon sign, perhaps part of the word “star” referred to in the title. This reference to light could also indicate something of the picture’s meaning: the light issuing from the room, the light mood of the two friends, the light of the electric sign, a shape that represents a lampshade, and even the roses on the women’s blouses (after all, flowers need light to grow) make one think of illumination. But this light is artificial, as might be the characters of the women; the scene is a nocturne in which the light is electric, produced by manmade inventions—a recognition of what the artist does. Over the Star stands as a satisfying summation of what Howard attempts pictorially in the exhibit. It is also a powerful example of the artist’s unique style of figure painting and his clever compositions that lure the viewer into alternating moments of contemplation and unexpected discovery.